On August 11th 2011 The Go-Go’s will get a star on the Hollywood Walk of Fame – the Los Angeles punk-pop girl band formed in 1978 and is still performing. 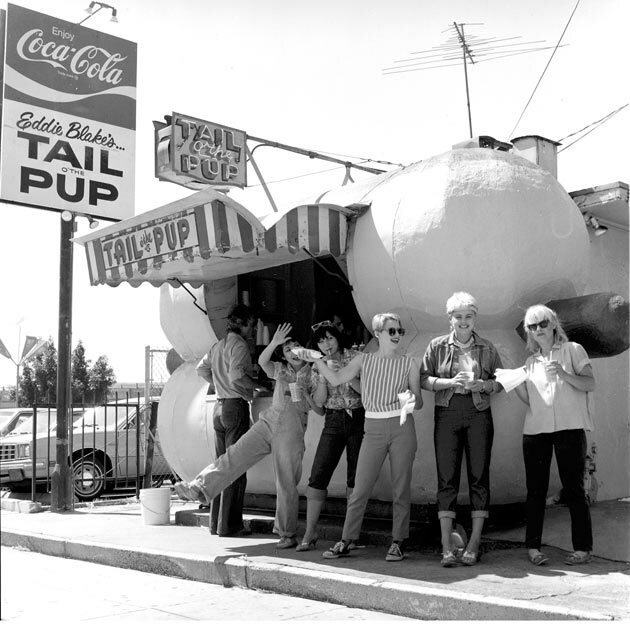 I shot this photo of the girls at the historic hot dog stand ‘Tail of the Pup’ on La Cienega in 1980. The band line up was L-R Jane Weidlin, Margot Olavarria , Gina Schock, Belinda Carlisle and Charlotte Caffey. I loved LA in the early 1980’s : the architectural nostalgia, neon, buildings, artifacts were everywhere and they reminded me of 40’s and 50’s Hollywood films that I saw as an art student in London. The LA punk style often echoed 1950’s style from rockabilly to capri pants and stilletos. Sadly the site of the ‘Tail of the Pup’ is now a parking lot and the giant ‘hot dog’ is stored in a warehouse in Torrance. This entry was posted on Friday, July 15th, 2011 at 9:29 am	and is filed under Portraits, Punk, Street Style. You can follow any responses to this entry through the RSS 2.0 feed. You can leave a response, or trackback from your own site. Regarding your Go Go’s Tail O’ The Pup Pic. I Love the photo, but am almost positive that’s Kathy Valentine, not Margot Olavarria. I used to work for Greg Shaw’s Bomp!. We featured a Go Go’s pinup in Bomp! Magazine in 1979 that included Margot, and she had very curly black hair.